The snow isn’t too bad, but enough to reduce our schedule. The Tuesday 9:00am Keep Strong class is Keene Valley is cancelled today. While the roads are passable, Magda is abroad and our subs have long drives and school delays that prevent them from arriving by class time. Schroon Lake will be open this evening for Beth’s 6:00pm Hatha. Debbie’s 7:30pm Shamanic Flow has already been cancelled so she can see her son in the Schroon Lake Central holiday concert. True North Yoga grew to two locations in July, and now the newly added Keene Valley, New York, studio has ungone further expansion. Our newly enclosed front porch has opened up lots of room on the heated floor for more yoga mats. 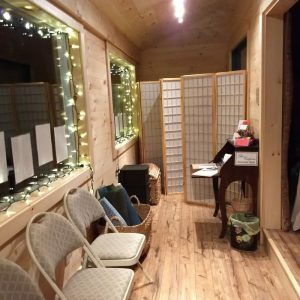 The studio expansion means there is room for you and your friends in our classes and workshops, and we are looking forward to sharing some great offerings with you in 2018, including the first ever Adirondack Chant Fest – a day-long celebration of the sounds of yoga. The Chant Fest will feature Kirtan led by Adirondack locals, singing bowl meditations, and sound baths, from 10:00am to 10:00pm on April 7, 2018. Save the date! We will continue to honor community with regular monthly Reiki shares and drum circles. Ladies, you can embrace your sacred feminine at Red Tent Temples in Keene Valley or New Moon Goddess Circles in Schroon Lake. 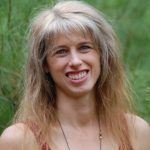 Debbie Philp will be bringing Moon Salutations, Restorative, Reiki and Yoga Nidra, and Shamanic Healing for Self-Care workshops to both locations throughout the year. Is 2018 the year you become or expand as a yoga teacher? Do you want to learn to practice hands on energy healing? True North Yoga’s Keene Valley studio is the place to be! In Debbie’s Energetics of Yoga training programs you will deepen your practice and change your life. The element-based advanced modules for yoga teachers who are ready to evolve are offered throughout the year. If you wish to take your yoga practice to the next level or become a yoga teacher, the next foundational program begins in October 2018. There are also opportunities to learn Reiki. You will find Levels One and Two of Shamanic Reiki, which blends traditional Reiki with other shamanic healing practices, offered a number of times next year. If you would prefer Usui Reiki, we will also be hosting those trainings. Between the special events, we always have a great line up of weekly yoga classes for you. Our schedule is full of creative and unique classes led by well-trained, authentic teachers. Now that our physical expansion is complete, we look forward to expanding our class offerings in the year to come. There’s lots of great stuff on the calendar already, and we are looking forward to seeing you often in 2018! It’s beginning to look a lot like…time for a winter weather closing policy reminder! 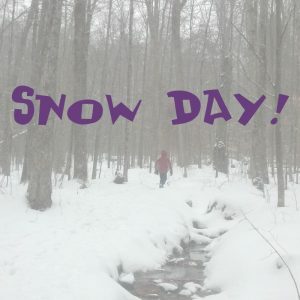 Our basic school day plan is to close whenever the local school district has a snow day. This allows those of us with school-aged kids to be home with them and keeps us off snow-covered roads. If Schroon Lake Central or Keene Valley Central is closed, the respective studio will also be closed. On weekends and school breaks, we will coordinate with our yoga instructors to determine if we can open. We will, of course, respect any state of emergency declarations and stay off the roads. We will announce closings on Facebook, by email to our year-round list, and on this news page. Please check before heading out and keep in mind that some of our teachers have a distance to drive and may not be able to make it even if local conditions are passable. We will do our best to keep you informed. Stay safe and stay peaceful! From what I’ve observed during my nine years of teaching yoga, it’s not hard to get someone to try yoga for the first time. It’s getting him or her back for the second round that’s the challenge. Because most yoga teachers, myself included, can’t take the time during a 75-minute multi-level class to fully explain to newcomers what to expect, here is what you really need to know before your first yoga class. Once you discover the silence, you’ll keep coming back to your mat. The next time you practice, you can be pretty sure you’ll be right back to struggling with your ego, trying to find the silence again. But over time the poses will feel a little less awkward. You may be a bit more balanced and feel a touch more coordinated. You will begin to move with grace. And you may discover that you are more flexible than you thought. Check out our beginner-friendly yoga class schedule to choose your first class and contact us if you have any questions. The holiday season is upon us, and that means endless joy, family bliss, and abundance, right? (Yeah, even the yoga teachers are snickering at that.) Traffic, crowded stores, and unrealistic expectations can turn bliss into tension. But you don’t have to fall into the holiday stress trap. An affirmation practice can help. I embrace the holiday season with joy and an open heart. To use an affirmation powerfully, repeat it daily, out loud, with conviction. It helps to say it three times in a row, three times per day. This way, you are programming your mind into believing it to be true. Where your thoughts go, your emotions follow. It’s the same mechanism that makes us cry during a sad movie scene, as if it were happening in reality. 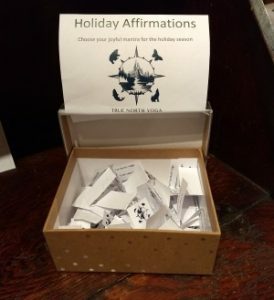 To get started, you can choose a holiday joy affirmation from the box when you visit one of our yoga studios. Your yoga practice will also help relieve holiday stress, so check our schedule for a class in Schroon Lake or Keene Valley, New York. Still digging out? We are too. Beth’s Wednesday 9:30am Gentle Hatha for Beginners class is cancelled tomorrow, March 15th. We look forward to resuming classes on Thursday evening with Jen’s 5:30 Yin Yoga class, followed by our monthly Reiki Share and Healing Circle. After all the shoveling, we could use some self-care. Due to the approaching winter storm, we plan to be closed Tuesday evening, March 14th, for Beth’s 6:00pm Hatha Class. As we send this on Monday evening we plan to be open for Debbie’s 9:30am Power Vinyasa class. If Schroon Lake Central closes Tuesday morning, however, that class will also be cancelled for the day and the studio will be closed for the day. We will send another email in the morning to inform you of any changes. 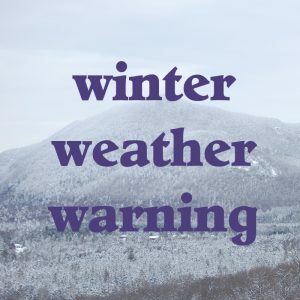 It’s too soon to call on Beth’s Wednesday morning class, but if Schroon Lake Central is closed on Wednesday that morning class will also be cancelled. Stay safe, warm and peaceful! Due to snowy roads, the 5:30 Yin Yoga class is cancelled this evening. We expect to be open for our regular Friday classes. If you must be out this afternoon, please drive safely. Our studio’s policy is to close whenever Schroon Lake Central School has a snow day. On non-school days, or when the school has a delayed opening, we will make a decision based on conditions. Please keep in mind that, even though conditions may be okay near the studio, many of our students and some of our teachers have to travel further and may not be able to get to the studio from where they are. The safety of our entire yoga family is our first priority. Due to poor road conditions, the 9:30am Yoga for Every Body class is cancelled today. We will be open for 11:00am Restore & Renew and 2:00pm Adaptive Chair Yoga. If you must be out this morning, please drive safely. Move and stretch with awareness. Strengthen your muscles and bones. Quiet your mind. Relax into the present moment. Feel your center. Discover your True North in the North County. 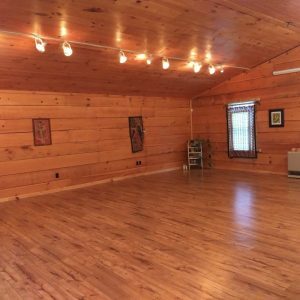 Experience Yoga and Wellness in the Adirondacks at True North Yoga. It is the mission of True North Yoga to provide a welcoming atmosphere where any individual, regardless of physical condition or circumstances, can participate in empowering and transformational yoga and wellness practices to nurture a healthy body, calm mind and peaceful spirit.